Nutella Raspberry Martini for two! I’m here to wish you a Happy almost-Friday! Now can we drink, please? 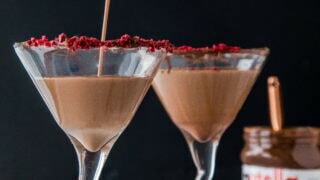 Can we drink rich cream, Nutella, and booze garnished with crushed raspberries? Oh yes, yes we can. I’m not quite sure why this week is requiring a drink so badly, but maybe it’s the cold weather? Or, maybe it’s because I’m starting my days with hot chocolate, and so I need to end my days with chocolate, too. 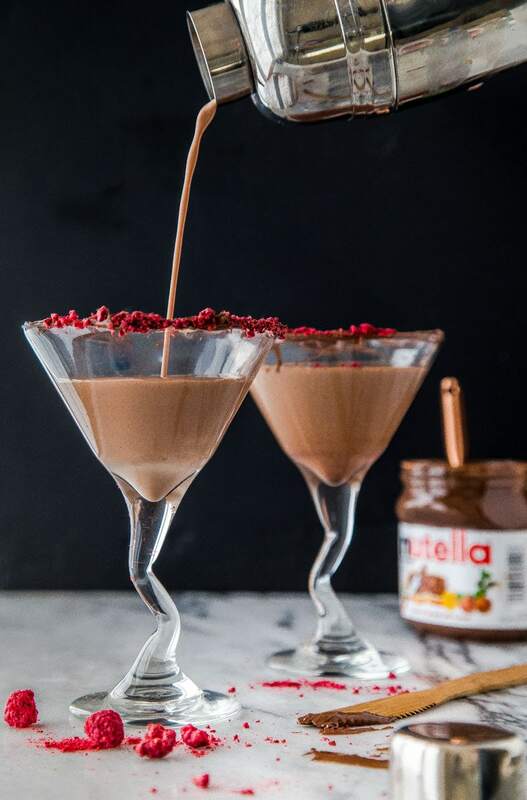 This Nutella raspberry martini represent everything I want in a chocolate martini–it’s rich and thick (thanks to heavy cream–you can use half and half if that makes you happy), it’s chocolatey, it’s nutty, and it has a pop of fruity raspberry. Has Nutella ever met raspberry before? They are scrumptious together, but even better with boozy raspberry, also known as Chambord. I bought a wee little bottle of Chambord for my Raspberry White Hot Cocoa, and have been spilling it into other cocktails all winter long. Note that I did not say I’ve been spilling drinks all winter long. Nope, not me. I’m a lady. 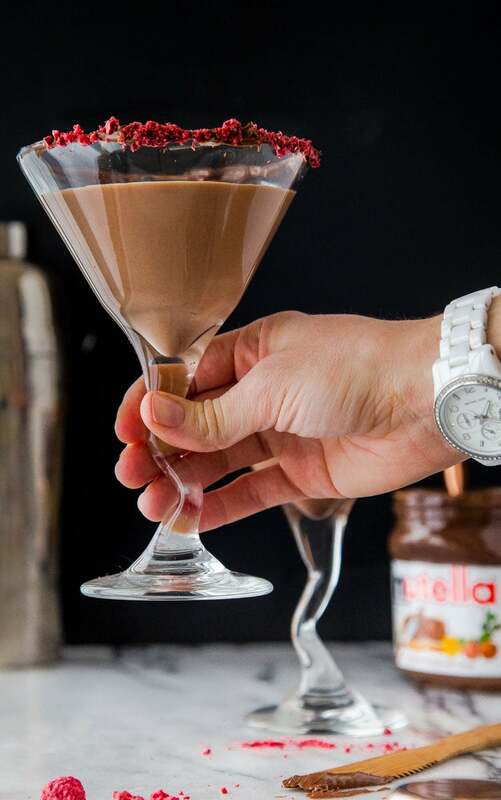 Speaking of making a mess of yourself, I was kinda thinking you and your honey could sip on this Nutella Raspberry Martini as a precursor to whatever date night plans you have. As for us, our anniversary is one week after Valentine’s Day, so I’ve got to keep the love train moving along! If you’re staying in, try ending your night with these, especially if you love someone who says they’re really not into desserts. This is the perfect dessert for someone who says they don’t like dessert. Don’t tell them it’s full of Nutella–just tell them it’s got lots of booze. That’s all they really need to know. Definitely a fun cocktail for Valentine’s Day! I’ve never had nutella in a cocktail before but now I can’t believe I haven’t. I’m kind of thinking that this is the breakfast of Champions! Now let’s have some brunch drinks, Stat! I love this, and you! Haha! Now there is a dinner for two in some very pretty glasses! Or maybe one… Whoop-ee! Next men only poker night, I’m staying in, alone! Whenever we meet again – a conference, a retreat, whatever – we are going to make a batch of these and cheers to your cocktail brilliance! OMG this looks incredible, nutella is amazing on its own and I can only imagine how good it must be in cocktail form! I think my Valentine’s definitely needs to include these! Love the rich color the Nutella brings to this drink! SHUT THE FRONT DOOR. Nutella in a martini? You are a cocktail goddess. This week definitely deserves a drink!! And anything with nutella is right up my alley. I never would have put it in a martini, genius idea! Nutella in a cocktail? Brilliant! Loving these flavors together!! So fun! that’s how I’d prefer to consume this drank.